It's been a rough few weeks in the Warner/Fleishman household. The kids are fine, but not great. We are exhausted. We had a lovely Christmas week with Lynn's folks and brother in town, and with my folks visiting the day after Christmas. But Rex is going through separation anxiety, and thus couldn't easily be handed off to relatives, meaning Lynn or I had to be on top of him. He was also clearly slightly ill, as was Ben, but not very ill. He had some crazy nights, including being wide awake from 10 pm to 1 am a couple nights ago. Then last night, slept 6.30 pm to 6 am. Go figure. We're very lucky, we know. The stomach virus that threw us for a loop a few weeks ago was the first we'd had; friends have had a dozen with kids the same ages. The ear infection is probably the first; friends have had a dozen or more with some kids by Ben's age. And so on. But we're a bit tired and cranky, so I sound whiny. The good news is that Ben and Rex are handsome and can be in a good mood, and they try so hard a lot of time, even when feeling poorly, to be happy. That's a good trait, unless you mask all your symptoms! They're sleeping now, and we're hoping for a good night. 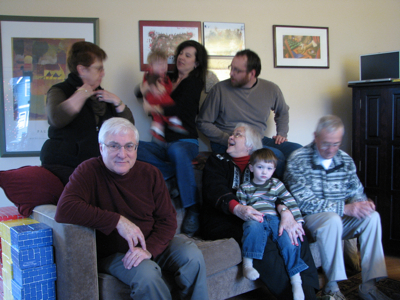 Meanwhile, here's a nice candid snapped while I was setting up the camera on a tripod for a family photo. That's my mom, Rex, Lynn, Michael Warner in the back row; my dad, Diane Warner, Ben, Steve Warner in the front row.